This week we’ll be looking at navigation, but put away your compass and sat nav, this navigation is online! When used in relation to websites, the term navigation refers to the menus and links which allow users to move from page to page within the website. Designing a well-structured and user-friendly navigation system is one of the most important stages in the development of a website. 2. To perform a task – e.g. buy a product, check the status of their order, post a message or contact you. If your visitor cannot find the part of your site that contains the information they need or the tool to perform the required task, they will become frustrated and may leave very quickly. This is why having clear, consistent and well-structured navigation is essential. There is no point in having a beautifully designed site with fantastic content if the visitor cannot use it or find the content they are looking for. In order to be easy to find and use, all navigation links should be clearly labelled. Using an image without text or an obscure/quirky phrase as a link will just confuse and frustrate your users. There are three main types of navigation. The most important links – e.g. Home, About, Contact etc. should appear in the same place on every page of your site. This is called “primary”, “top-level” or “global” navigation. These links are always visible to your visitors whether they are on your home page, a product page or reading your Terms and Conditions. On this site, our primary navigation is in the yellow bar at the top of each page. Primary navigation also often appears in the top left of websites. Secondary navigation refers to menus that do not appear on every page of your site – e.g. a list of product categories in the sidebar of the shop section. It is important that these are organised logically so that users can easily find the content they are looking for. A good rule of thumb is that it shouldn’t take more than three clicks to find any piece of information on your site. Got a question about navigation? Contact us or leave a comment – we’d love to help. A few weeks ago we blogged about different file formats and how to reduce the size of your files while maintaining image quality. This week we are looking at the actual units which measure file size – Kilobytes, Megabytes, Gigabytes etc. A bit is the smallest amount of data that can be processed by a computer, it can only have a value of 0 or 1. We rarely work with information that is so small it can be saved in bits. Bits are usually assembled in groups of 8 to form a byte. A byte is only large enough to store one letter or character. The word “curious” has 7 letters and so would take 7 bytes to store. A kilobyte (KB) is 1,024 bytes, instead of 1,000 bytes as you would expect. This is because computers use the binary system rather than the decimal system with which most of us are more familiar. It has been said that 5 extabytes could store all the words ever spoken by human beings! Confusingly, many hard drive manufacturers use the decimal number system to define amounts of storage space. In other words, 1 MB is defined as one million bytes, 1 GB is defined as one billion bytes, etc. However, as your computer uses a binary system you may see a difference between your hard drive’s stated capacity and the capacity your computer recognises. For example, a hard drive that is said to contain 10 GB of storage space can store 10,000,000,000 bytes. However, on your computer you need 10,737,418,240 bytes to reach 10GB. As a result, instead of recognising 10 GB, your computer will only show that there are 9.31 GB available. This is not due to a fault in the hard drive, it is simply the result of the two different systems of measurement. Got questions on file size? Get in touch – we’d love to help! We’ve all heard of logos, branding and visual identity but what is the difference between the three? A logo is a symbol or graphic mark used to identify your business or organisation. It is not essential that a logo represent the product or service of its company, but it must be memorable and easy to recognise and describe. Your visual identity is the visual representation of your company. Your logo works with your corporate colours, typefaces, signage, stationery, brochures, and website etc to create your visual identity. To create a strong visual identity it is important that each of these aspects are consistent – for example if you have corporate colours they should be used throughout your visual identity, in your signage, your website, your stationery and any other printed materials you produce. The broadest area is branding. Your brand is your company’s personality, your values and aims. A brand is more than visuals, it is everything that a company or organisation owns, does and produces. Branding can encompass everything from customer service to events, copywriting, products and posters. Need help with your brand, visual identity or logo? Contact us today! We’d love to help. Are you puzzled by PNGs, jaded by JPEGS? Do you go googly eyed at GIF’s? Our simple guide to JPEGS and other common digital image formats is here to help! Two of the main factors to consider while saving digital images are image quality and file size. Typically, high quality images take up a lot of computer memory, however, choosing the correct file format can help you maximise your image quality while minimising file size. File size is particularly important for images used on websites, as anyone with a slow Internet connection will tell you! One of the reasons there are so many different types of file formats is the need for compression. Compression describes ways of reducing the size of the file. Compression can be “lossy” or “lossless”. Image saved as JPEG – Size:24k. Note: blurry edges on logo. When you save a file as a JPEG you can choose how much compression to apply, the more you compress your image the smaller a file it will be, but you will lose image quality. JPEG Compression is “lossy” which means that you lose some of the file information and your image is subtly changed when you save it as a JPEG. JPEGs are typically used to save photographs or any images with lots of tones or gradients. They are not good with sharp edges, text or line drawings; these can appear blurred unless saved with very little compression. Image saved as GIF – Size:56k. Note: grainy texture on photo. Unlike JPEGs the GIF format gives very good results when saving text, logos, line drawings or any image with sharp edges and limited colours. The GIF file format is limited to a total number of 256 colors or less so it does not give good result for images with gradients or a wide range of tones (e.g. photos). GIF files also support animation. Image saved as PNG – Size:176k. Note: large file size. The PNG file format was developed to replace GIFs and is not fully supported by very old web browsers. PNGs are non-lossy files. Unlike JPEGs photographic images can be compressed without degrading image quality. The PNG file format also supports transparency (e.g. images with a transparent backgrounds) better than the GIF file format. PNGs are usually larger in size than JPEGs and are best used for text, logos or line drawings or for images that need a transparent background. Looking for more advice on the best file format to use? Get in touch! We’d be happy to help. 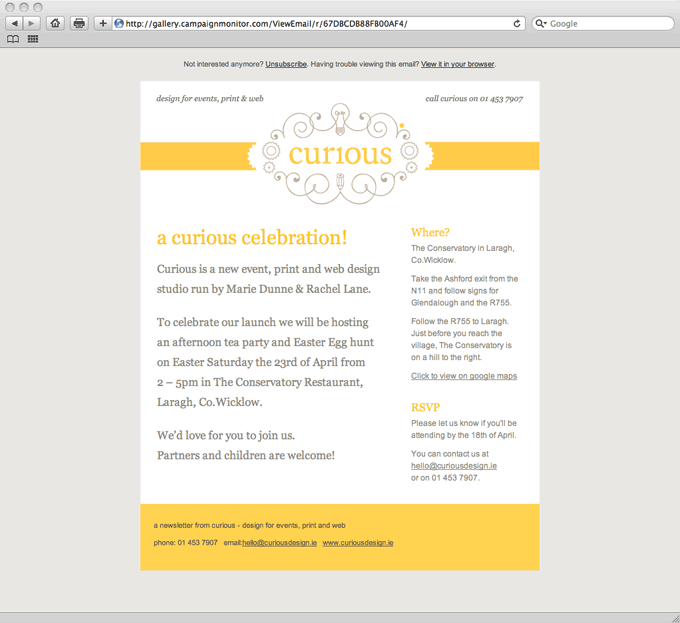 This week’s design a-z term is hosting – website hosting that is, not dinner parties! If you are unfamiliar with web hosting all the technical terms associated with it can be confusing so we’ve put together a simple explanation. Web hosts don’t serve canapés but they do have computers (called servers) that are connected to the Internet. Websites that are stored on these computers are visible online to anyone with an Internet connection. When you pay for hosting you are renting space for the files that make up your website on one of these computers, so that your website can be seen online. Barring technical problems, a web host operates constantly, 24 hours a day, 7 days a week so that anybody in the world can view your website at any time. As well as hosting your website online you will also need a domain name ( the address of your website – our domain name is curiousdesign.ie) – this can be purchased through your hosting company. We are happy to organize hosting and domain name registration for our clients. Got a question about web hosting? Contact us today! We’re feeling very cheery here in curious this morning – only one more day until the weekend and according to the weather forecast tomorrow will be sunny! 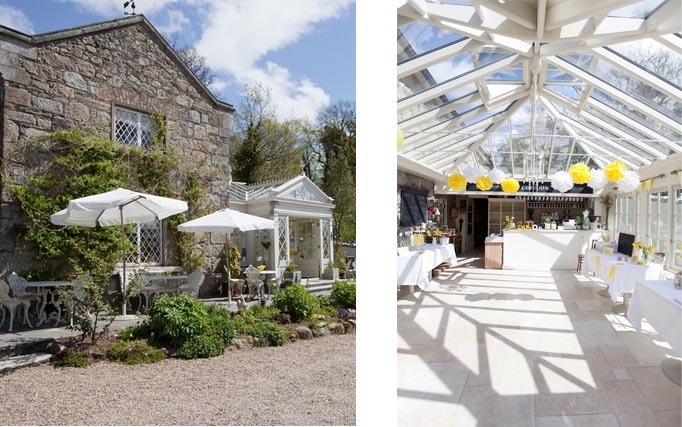 One of my favourite summer treats is enjoying some tea and cake in the sunshine, and one of my favourite spots to do this is The Conservatory, a beautiful Restaurant in Laragh, Co. Wicklow and the venue for our launch party back in April. Lisa de la Haye, the owner, is a lovely lady with impeccable taste and a real talent for interior design. The conservatory which houses the cafe is beautiful, bright and airy and the garden is the perfect spot for soaking up some sun. Lisa also has a gorgeous dining room which can be booked for private events. You can treat yourself to yummy cakes, scones and pastries on Thursdays and Fridays or a full lunch on weekends. And don’t worry if you overindulge – Glendalough is just around the corner so you can work off those cakes with a walk around the lakes! Where is your favourite spot for a weekend treat? The Conservatory is open Thursday – Sunday, 10am – 6pm. All photos by Magda Lukas. This week’s design term is an acronym you’ll often hear on the lips of web designers and developers: CMS. If you are are getting a website developed you’ll most likely be asked if you want one. But what does CMS mean? 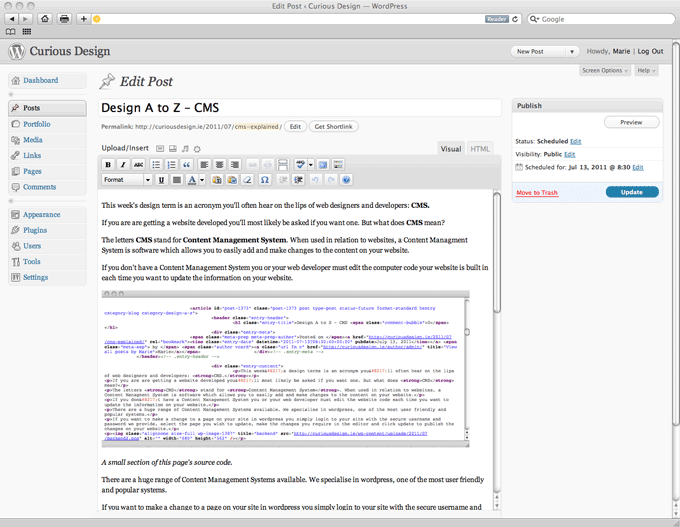 The letters CMS stand for Content Management System. When used in relation to websites, a Content Management System is software which allows you to easily add and make changes to the content on your website. If you don’t have a Content Management System you or your web developer must edit the computer code your website is built in each time you want to update the information on your website. A small section of this page’s source code. There are a huge range of Content Management Systems available. We specialise in WordPress, one of the most user friendly and popular systems. If you want to make a change to a page on your site in WordPress you simply login to your site with the secure username and password we provide, select the page you wish to update, make the changes you require in the editor and click update to publish the changes on your website. Once you have your login details updates can be made with any normal web browser from anywhere in the world – even with your smartphone. As well as making text changes, you can also create new pages, edit menus, write and schedule blog posts (so you can write 7 posts today and sit back as they are published over the following week!) upload images, add videos, slideshows, and much more, all without writing a line of code! CMS – Content Made Simple! If you have any WordPress questions let us know in the comments or get in touch – we’d be happy to help! Curious client (and my hubby!) comedian Colm O’Regan is bringing his new show Dislike: a Facebook guide to the recession! to Whelan’s this Sunday after a sold out performance at the Kilkenny Cat Laughs Comedy festival. 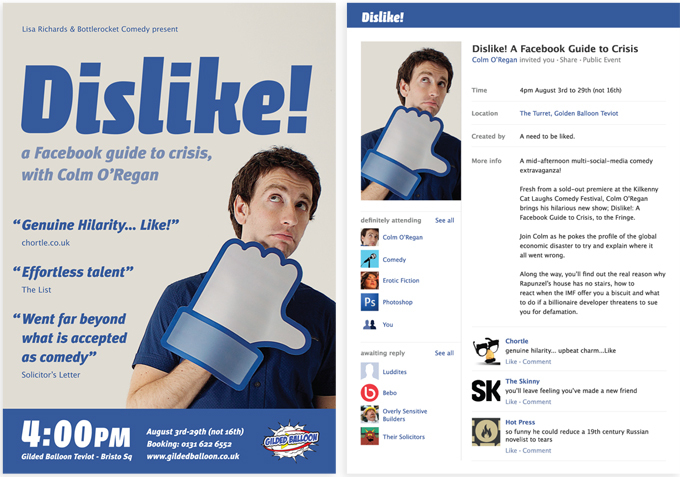 We’ve had great fun working on the promotional materials for the show – here’s a sneak peek of the Edinburgh flyer, complete with a giant custom-made facebook dislike hand and fake event invitation. If you can’t catch the show this Sunday Colm will be performing in Clonmel, Thurles, Ballybofey, the Galway Arts Festival and the Iveagh Gardens Comedy Festival before heading over to Edinburgh for the Fringe in August. For more information on gigs visit his website. You can get your tickets for Sunday here or buy them on the door on the night. See you then!